Each year billions of dollars are spent improving performance of individuals and teams at work. It is important for everyone to learn and grow, and the pressure to perform is higher now than at any point in the last 20 years. On Monday it is Valentine’s Day in America, so the performance pressure increases ten fold for anyone who is in a relationship. Let me rescue you. Especially you men. My only caveat is that this advice is coming from someone who gave an amazing set of knives and a classic cookbook to his wife (then girlfriend) for their first Christmas. 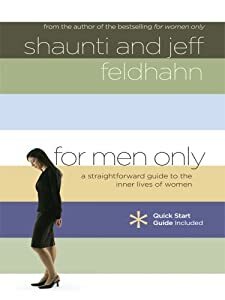 Just finished a book set by Shaunti and Jeff Feldhahn – One for men to better understand how women think (For Men Only) and one for women to better understand how men think (For Women Only). Easy to read, <200 pages, entertaining, and amazingly accurate. A worthwhile read and it will start some great conversations. Include an IOU for a dinner/date night to talk about what you read and you are home free. Development and growth is not just for work. Communication – Always room for improvement. Right?